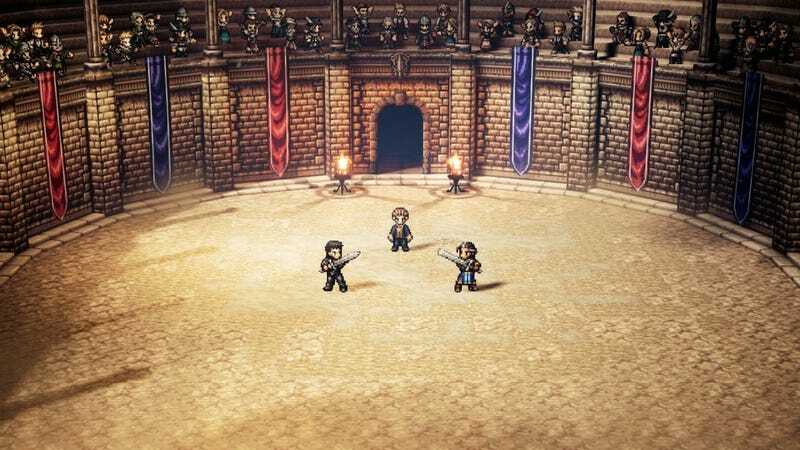 Octopath Traveler’s battle music has all of the zest you could want, brimming with quick drumbeats and arpeggiated chords. One simple trick ties together the game’s story and boss battles, creating amazing musical cues that make each new encounter even more exciting. Octopath Traveler assigns each character an instrument that’s used prominently in their leitmotifs, which are also used during the transition from story scenes to boss battles. For instance, the cleric Ophilia is associated with the flute, while Alfyn the apothecary is associated with the saxophone. Octopath Traveler bridges narrative scenes and boss fights with a quick vamp before the boss fight kicks in. The best music comes when you play as Olberic the knight. His instrument is the trumpet, giving these moments a powerful and brassy boost. These music cues don’t just sound good, they also maintain the momentum and pacing of the narrative. Keeping things continuous helps the story flow into the combat without pausing, which means that the moments maintain their urgency. Octopath Traveler’s stories are remarkably humble compared to other JRPGs—Ophilia might spend a chapter helping children search for a lost trinket and protecting them from a nasty wolf. The music communicates clear stakes, turning these moments into important tests for each character. Lots of video games have fantastic music. Persona 5’s funky tunes communicate a counter-cultural rebelliousness. Bastion’s integration of diegetic songs and folksy rock stress the game’s status as oral tradition. But often, I find myself wondering why games don’t try to merge their interactive qualities with their music more often. Some games manage it—Nier: Automata has cues directly tied to boss attacks—but it can often feel like music exists separate from the rest of the game. Octopath Traveler’s technique is simple but effective. It maintains a connection from one moment to next, keeping things exciting and getting you pumped for the next confrontation.